It’s baby shower day and Arthur Nishimoto’s gift is next. His pregnant classmate unwraps a gray onesie with a Star Trek logo that matches the one on Nishimoto’s T-shirt. The room full of University of Illinois at Chicago computer science graduate students erupts in laughter. Spare Nishimoto the jokes about how computer geeks have memorized every line of every science fiction movie. For the last two years, much of his free time went into designing the guts of Star Trek’s starship Enterprise, from the bridge to the transporter room. His design might offer a preview of the future of video games. At first, the Enterprise lived only in the two-dimensional world of a computer screen. But in recent months, Nishimoto has been able to walk around the command center of the ship that figured prominently in the Star Trek movies and television series. 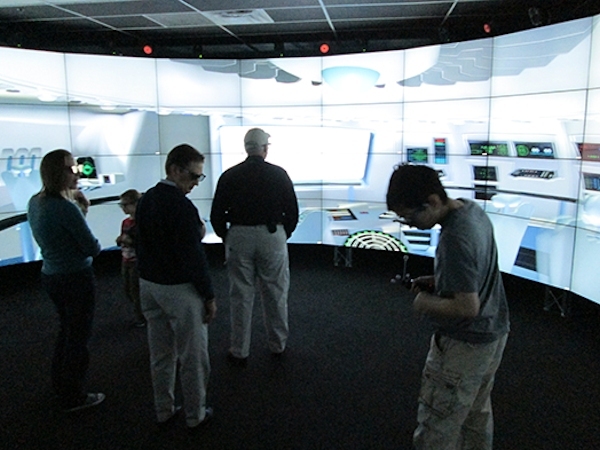 That extra dimension took shape thanks to CAVE2, a three-dimensional virtual reality system unveiled earlier this year at UIC’s Electronics Visualization Laboratory. Private groups are sometimes able to arrange tours by contacting the lab. CAVE2, comprised of 72 high-definition LCD screens arranged in a circular pattern, can transport users into a virtual world that may appear to be the surface of Mars, a street corner in Saudi Arabia or, when Nishimoto is working the system, the inside of the Enterprise. The latest virtual system is born out of CAVE technology that has advanced over more than 20 years along with computer visualization innovations. By putting on a pair of 3D glasses (like the ones you wear at the movies) and stepping inside CAVE2, viewers feel as if they’re walking through the doorways of the Enterprise. Nishimoto studied Star Trek videos and set designs to make his model precise. Eventually, he’d like to see his Enterprise design emerge as a video game. Virtual interactive experiences where players maneuver their way through an environment are part of video gaming’s future, UIC researchers say. That new paradigm poses challenges for video game designers, he said. CAVE2 is a sort of sandbox for designers anticipating that frontier. Nishimoto was, quite literally, in on the ground level of the project installation. As CAVE2 was constructed this summer, he helped string wires and even installed some of the jet-black floor tiles. Once the installation was complete, he launched his Enterprise into the mind-boggling new arena. The personal project he started after an illustration class suddenly burst to life. In the process of examining the intermix chamber, cargo deck and other features, Nishimoto quickly saw that some designs that looked perfect on a computer screen didn’t pass muster when he took a ruler to them in CAVE2. With the help of CAVE2, he’s still adding new touches to the Enterprise and perfecting it for its possible future in a video game.